Squash House Quilts: Rescue at Sea! There's no place like home! How many times have you said that when you return from time away? Sure, you have a great time and wish you could have stayed longer, but the truth of the matter for us is that we love the Squash House and love being home! Having said that, we had a very interesting trip! Sorry I didn't post after being in Roatan, but the ship's Wi-Fi was terribly expensive for the little time you got. I couldn't find free wi-fi hot spots in any of the other ports, either. So we decided to just pack away our computers and live in the dark ages for the remainder of the trip! This took some getting used to but after a bit I started reading a great book and was quite happy! It will take me some time to download all the pictures and sort through them, but in the meantime I thought I would tell you of our rescue at sea! After our last port of Cozumel, we began the 2-day cruise back to Tampa. The day after leaving, around mid-day, our captain came on the PA system to announce that they had been contacted by the US Coast Guard. Apparently the Coast Guard received a distress call from a sailboat in the Gulf of Mexico. Our ship was closest and was asked to perform the rescue of the people on board! Mr. Squash was finishing up his shower after we had worked out so I told him I'd go topside with my camera and watch for the sailboat. I spent quite a bit of time on the stern with lots and lots of other passengers. We would see a Coast Guard plane circling over and over around one area, which we assumed was the location of the sailboat. After quite a long time it began to come into view. 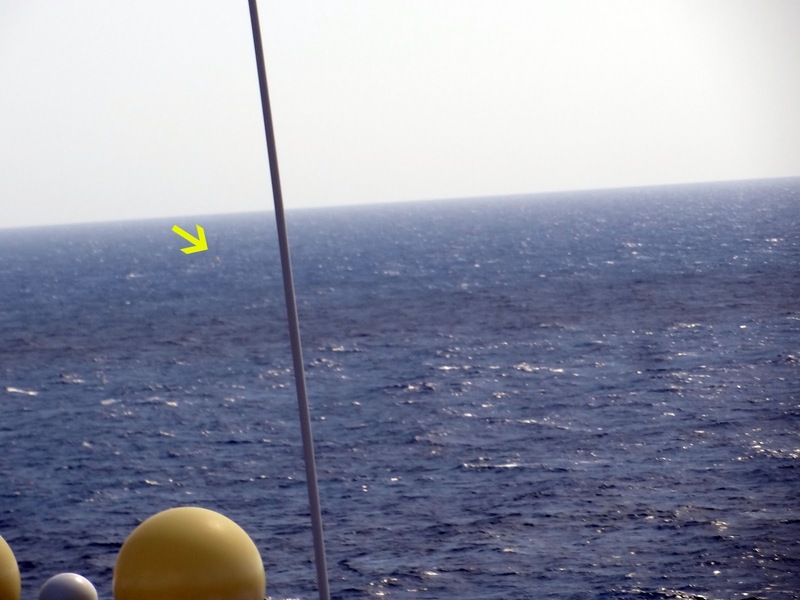 If you click on the photo above and look just off the point of the arrow, you can see the small boat. I watched as we got closer and closer and finally decided to go look for Mr. Squash. I couldn't find him and thought I would go back to watching, but this time out of the sun if I could! 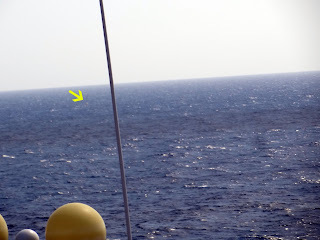 I found a great spot on the port side which just happened to be the exact spot where the rescue took place! This is a video I made of the rescue - it's a bit over 5 minutes long and worth the watch! I was standing next to a Japanese group - you'll hear their voices! The best part is the applause after the couple were safely on the rescue boat! We never did see the rescued couple after that. I assume they were kept hidden away for whatever reason. We surmised that the rudder on their boat may have broken or the sail torn, but so far we have no idea what the problem was. We're just glad that they are safe and sound! **Note: A no-reply commenter asked if we knew what they did with the boat. Mr. Squash said the Coast Guard will probably send another ship to tow the sailboat back to land. I hope to have another cruise post up in the next day or two! Thank Goodness that your ship was nearby and saved those people. I enjoyed watching but was also overcome with emotion imagining what they were feeling! That was exciting! I wonder what happened to their boat. Talk about dramatic! How exciting! Now that's some excitement that I bet you weren't expecting! Glad it all worked out - can't imagine how they felt. Wow! That rescue was something to watch! Do you know what they did with the sailboat? what happens to the sailboat now? Now that's a "Feel good" post. When I first started reading your post, I was afraid your ship had had some problems. We've heard so many bad things about cruise ships lately Certainly glad all ended well! A sea adventure! Exciting stuff. Best part is the couple was safe. How exciting to watch! I'm sure those people were glad it was a cruise ship that was close by and not some military ship--you probably had better food! Hope they weren't stranded for long before your ship came by. How interesting. That added a little excitement to the trip. The seas look a little rough but it looks like you had some great weather for your trip. Those "greeter" parrots are funny. I think I would have steered clear too. Just strange for me. Great old photo of you and Mr. S.
Love your version of Stephanie's pattern. Very pretty. I am sure the quilting is going to look great too. Thank Goodness there was someone close the Coast Guard could send to help. And "Oh my Word" Candace, it WOULD be your boat! I tell ya, you and Mr. Squash do live with lots of adventure. Instead of reeling in the fish...you taped the reeling in of distressed sailors.